Mixing computational chemistry and theoretical math proved a winning formula for Emory chemist James Kindt (center), his graduate students (from left) Xiaokun Zhang and Lara Patel, and mathematics graduate students Olivia Beckwith and Robert Schneider. Photo by Stephen Nowland, Emory Photo/Video. Computational chemists and mathematicians have developed a new, fast method to calculate equilibrium constants using small-scale simulations — even when the Law of Mass Action does not apply. The Journal of Chemical Theory and Computation published the resulting algorithm and software, which the researchers have named PEACH — an acronym for “partition-enabled analysis of cluster histograms” and a nod to the method’s development in Georgia at Emory University. “Our method will allow computational chemists to make better predictions in simulations for a wide range of complex reactions — from how aerosols form in the atmosphere to how proteins come together to form amyloid filaments implicated in Alzheimer’s disease,” says James Kindt, an Emory professor of computational chemistry, whose lab led the work. Previously it would require at least a week of computing time to do the calculations needed for such predictions. The PEACH system reduces that time to seconds by using tricks derived from number theory. “Our tool can use a small set of data and then extrapolate the results to a large-system case to predict the big picture,” Kindt says. 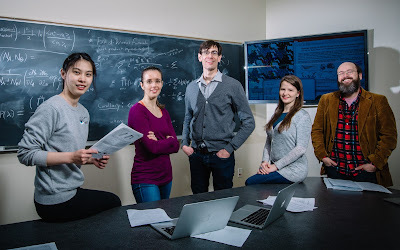 The research team includes Lara Patel and Xiaokun Zhang, who are both PhD students of chemistry in the Kindt lab, and number theorists Olivia Beckwith and Robert Schneider, Emory PhD candidates in the Department of Mathematics and Computer Science. Chris Weeden, as an Emory undergraduate, contributed to early stages of the work. The equilibrium constant is a basic concept taught in first-year college chemistry. According to the Law of Mass Action, at a given temperature, no matter how much of a product and a reactant are mixed together — as long as they are at equilibrium — a certain ratio of product to reactant will equal the equilibrium constant. At much smaller scales of around dozens of molecules, however, the Law of Mass Action breaks down and does not apply. The Kindt lab uses computers to simulate the behavior of molecules, in particular how they self-assemble into clusters. Sodium octyl sulfate, or SOS, is one of the compounds the lab uses as an experimental model. SOS is a surfactant that can act as a detergent. It forms little clusters in water that can encapsulate oil and grease. Simulations of how SOS molecules come together can predict the distribution of sizes of clusters formed under different conditions, in order to improve the design of soaps and detergents, and to better understand biological processes such as how bile salts break down globules of fat during the digestive process. In a key test of their model, the lab needed to make sure that the equilibrium for the assembly reaction of SOS molecules into clusters matched up with experiments. Kindt decided to approach the problem by considering all the different ways the molecules in a reaction could group into clusters of different sizes in order to arrive at an average. After doing some reading, he realized that these different ways of molecules grouping were what number theorists call integer partitions. A partition of a number is a sequence of positive integers that add up to that number. For instance, there are five partitions of the number 4 (4 = 3+1 = 2+2 = 2+1+1 = 1+1+1+1). The partition numbers grow at an incredible rate. The amount of partitions for the number 10 is 42. For the number 100, the partitions explode to more than 190,000,000. That same explosion of possibilities occurs for the ways that molecules can cluster. Lara Patel and Xiaokun Zhang worked on a “brute force” method to get a computer to run through every single way to combine 10 molecules of one type with 10 molecules of another type. The problem was it took one computer working a couple of days to do a single analysis. And the computational time needed if just a few more molecules were added to the analysis went up exponentially. The computational chemists had hit a wall. Kindt reached out to Ken Ono, a world-renowned number theorist in Emory's Mathematics and Computer Science Department, to see if any of his graduate students would be interested in taking a crack at the problem. Olivia Beckwith and Robert Schneider jumped at the chance. The chemists and mathematicians began meeting regularly to discuss the problem and to learn one another’s terminology. “I had to pull out my son’s high school chemistry book and spend a weekend reading through it,” Schneider says. The two mathematicians suggested a strategy that could make the problem much easier to calculate, based on a theorem known as Faà di Bruno’s Formula. Patel and Zhang used this new algorithm to put together a piece of software to analyze data from the computer simulations. The resulting system, PEACH, speeds up calculations that previously took two hours to just one second. After demonstrating how PEACH simplifies simulations of SOS assemblages, the research team is moving on to simulate this process for a range of other molecules.